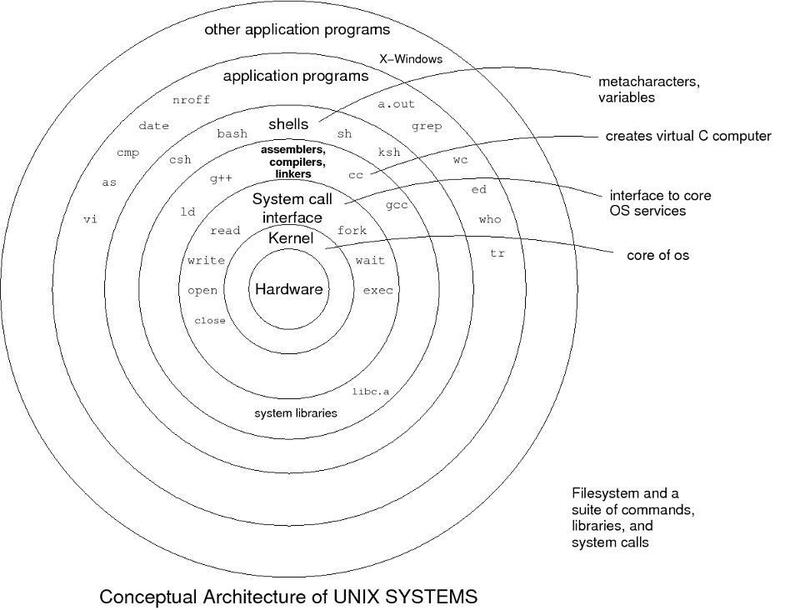 Here is an image of a conceptual architecture for unix systems (edit - not mine or anyone's in particular - just pulled it from the net). What would you change, add or delete and why? The first thing that comes to mind for me is that that "assemblers, compilers, linkers" could be revised to read "development platforms, extensible frameworks, compilers, linkers, assemblers", something like that. Or should "development platforms, extensible frameworks" be a type of application program? That onion picture doesn't quite work for me. A compiler is necessary to build C programs, but after that, the programs are freestanding. Shells don't exist at any higher level than application programs; they're just executables too. So sometimes the diagram describes the way things are connected; other times, it just describes how they're commonly used. Agreed. It really is not technically accurate when you think about it. The onion approach for the concept architecture does not work well at all. The system call interface layer could mislead the uninitiated into believing that system calls exist outside/above the kernel. If that were my "onion", I would delete the system call layer and enlarge the kernel, subdividing it into two layers (perhaps with a bit of shading): 1) drivers, adjacent to the hardware, and 2) system calls adjacent to userland. EDIT: Put differently, I'd relabel "kernel" as "drivers" and indicate that "kernel = system call interface + drivers". I would add a thin libc layer between the "system call interface" and the userland executables, instead of the compiler/assembler layer.